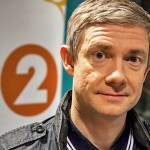 On New Year’s Day none other than Martin Freeman will be joining Trevor Nelson on BBC Radio 2 to spin a few discs (does that phrase even make sense in an age of digitisation?) and share his love of soul music. If you’re a music fan and a Martin Freeman fan, this one has to be a “must-listen”. The star of this year’s Christmas blockbuster The Hobbit and also BBC One’s Sherlock will be taking Trevor through his extensive record collection and playing some of his all-time favourite soul tracks. Get ready to see out the first day of the New Year with this very special hour as Martin shares the personal stories behind his song choices, as well as providing insights and colourful anecdotes from his film and TV work – all, of course, soundtracked by the very best in soul music. Thanks to Ringer Marie for the heads-up.